I'm in Chicago right now on my way to go and see Gene Wolfe for lunch, and then over to the Harold Washington Library to presign a few thousand books. Tonight Audrey Niffenegger and I are in conversation at the library. It starts at 6 pm. Details at WHERE'S NEIL. Tomorrow I talk and do a reading Solo at 7 pm at Rockefeller Chapel. University of Chicago. Do come, if you are in the area. The day after that - Thursday - I'm in New York doing a talk with Paul Levitz, former publisher of DC Comics. Details at Where's Neil and in the last blog post, and I'd link to them here but I am blogging on my phone. 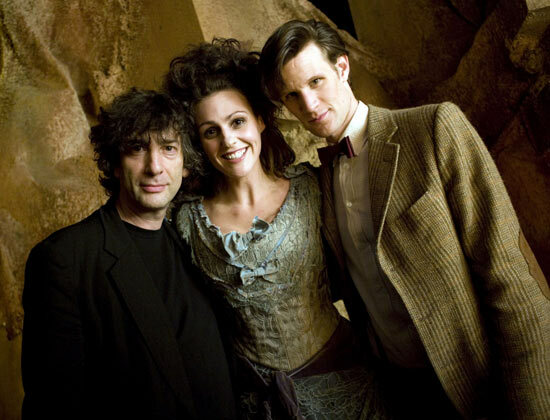 I can't even link to the photo of me, Suranne Jones and Matt Smith on the Doctor Who set that the BBC just released. But I will. You know I will. Postscript. Hah! I figured out how to do it from the phone. Someone asked if I had shrunk and I had to explain that, no, the camera is tipped to one side for dramatic effect.